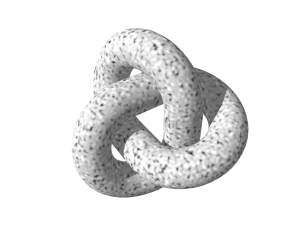 How to texture a surface generated by marching cubes algorithm? I'm working on a voxel game, and I have some problems with texturing. I have read the related questions on this stack exchange, but they seem adressing a generic problem (using triplanar texturing), and I think mine is simpler. You can see that the resulting geometry contains a limited set of polygons. Last I checked I saw only 44 of them. My idea was to uv map these polygons to a regular texture using a static map table, without having to use any triplanar texturing (currently, every polygon is mapped to the same values, so it's ugly). Is it valid ? It seems much simpler than triplanar texturing, but I can't find a single resource on the subject, so I'm wondering if it's a right approach. Where can I find / How can I generate a UV map for this kind of geometrical figure ? I have tried to use blender but it seems like my blender-fu is not strong enough. Is there some simpler software to generate UV map with models like this one ? Another way would be to procedurally generate your textures. This approach comes with its advantages and disadvantages. Most important tradeoff is that you can't draw your textures in an editor but have to code them using noise functions. The huge gain in your situation is that you can texture your terrain completely orientation independent. This is done by using so called solid noise. It is a three dimensional noise function. Using that you can code a function to generate the color value of any given position in 3d space. Then you sample just the points lying on the mesh faces. In other words, you carve out from the three dimensional texture. This is from the libnoise glossary. The following image shows an object that has a solid noise texture. Note that the texture does not warp anywhere on the object; it is uniform throughout the object. It would be very difficult to produce a non-warping two-dimensional texture map for this object. I know that it may not be your aim to code instructions for generating every texture you want to use. But it may also be a challenge and comes not only with the orientation independent advantage but also with heavily reduced storage space and unlimited zoom-in detail. I would be very interested if you would try to implement solid noise textures for your terrain. For any given marching cubes vertex, we wish to select a voxel with which to infer the vertex's attributes. We choose the closest non-air voxel, which by its definition must be located along the same edge the vertex is placed on. 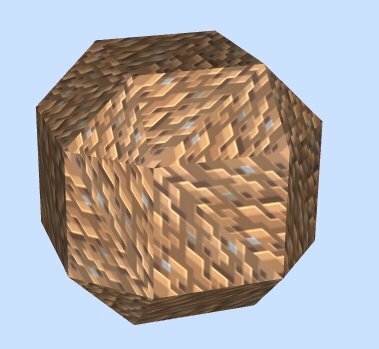 Furthermore, because the 'surface' we generate delineates air from solid, it follows that the two voxels along an edge containing a vertex must be one solid, and one air. Therefore, if each voxel adjacent to the current cube is indexed by the combination of it's inclinations along each axis, then we may infer two of its inclinations by the particular edge on which the vertex rests, and the third inclination by sampling both possible corners and selecting only the one that is solid. Thus, to sample the desired voxel efficiently, we establish a lookup table mapping each of the twelve cube edges to two possible voxel indices each, the upper and lower four bits of each being indices into the set of eight possible voxels. After sampling both voxels, we may add the two samples together rather than branching in order to select the solid one. If 'air' is a non-zero value, we may simply subtract it from the final result, since one of the operands is guaranteed to be that value. In C/C++, it could make sense to change long blockIds to an array of bytes/shorts/pointers, and remap each four-bit value in the table according to bits = 7 - bits. I haven't profiled it, though, so packing everything into a long may still be faster. Finally, in case of a non-zero air blockId, it's reordered so that in case of a large domain of blockIds, no overflow occurs. Wouldn't happen in the code above, since I'm using ints to store blockIds which are bytes, but it's something to consider. UV mapping does look like the correct way to go with this. I believe this answers your first question (but I may be wrong). About why Blender won't UV map this for you is because it's trying to unwrap it as one giant lump-thing. You need to add seams to the model so that Blender can split it appropriately - look at Blender's Official Guide to UV Mapping to see how to do this. Not the answer you're looking for? Browse other questions tagged 3d voxels uv-mapping or ask your own question. How to texture voxel terrain without triplanar texturing? “Marching cubes” voxel terrain - triplanar texturing with depth?